A new crew of galactic miscreants have been united to work together and save the galaxy in Asgardians of the Galaxy #1. The comic starts off with Annabelle Riggs being summoned to join Angela, daughter of Odin and Freya on a mission of the utmost importance. On this team is Skurge the Executioner, the Destroyer (an Asgardian weapon of mass destruction), Thunderstrike, and Throg – Frog of Thunder. Together the group encounters Nebula and her destructive ways. Nebula is up to no good and in search of how to summon Naglfar, the ship of the dead. Onboard this afterlife vessel are the bodies of the lost souls of the galaxy. This dead army has suffered for years and are seeking vengeance for their sorrow. They don’t care who calls them, the ship of the dead just wants to fight. A ragtag group of heroes trying to save the galaxy is not a new plot device, but it can be enjoyable when done right. 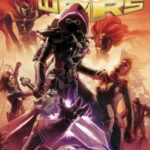 In Asgardians of the Galaxy #1, writer Cullen Bunn is trying to recreate the magic of Guardians of the Galaxy; and succeeds for the most part. 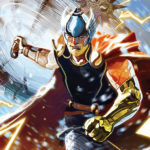 Bunn has a challenge because he is drawing on characters that are usually fifth or sixth back in the frame of many well-known comics, and now they are front row center and need to entertain the readers. 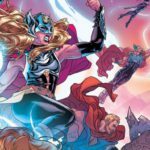 Unlike the collection of different species that populate Guardians of the Galaxy, Asgardians of the Galaxy #1 needs an Asgardian cast, and therefore contains some interesting characters. There is Throg, the frog version of Thor, Thunderstrike, Destroyer, and Angela the leader. You would expect to be drawn into the leader’s story, but I felt Angela was overshadowed by the relationship between Skurge and Riggs. Skurge and Riggs are combative, antagonistic, but friendly, and when Riggs transforms into Valkyrie, you can see a stronger bond between the warrior that Riggs can become, and the man that Skurge is. Writer Bunn is expecting you as the reader to take a leap of faith with some of the plot, no matter how ridiculous it might be. Bunn knows it’s hard to explain the symbiotic relationship between Anabelle and Valkyrie; he just asks you as the reader to go with it. Even when Throg is shown defeating countless enemies on the battlefield, Bunn introduces the amphibian Thor and states that obvious: yes this is real, you are not seeing things. We know that there are aspects of this story that seem a little over the top. For Bunn to recognize these leaps of faith in the narrative, is not only funny, but will allow readers the excuse to suspend their sense of disbelief, and just go with the story. Nebula is a great villain because she is capable of cruelty and terror. When the group arrives at the Planet of Temples, they find the Dwarves of Nidavellir chained up and floating in space, dead. Their fingernails were torn out, and they looked like they died in terror. This was all Nebula’s work. She has immense power and leaves the group to fight her army. What is most terrifying is that Nebula is acting like this to compete with Gamora, as she tries to assemble the infinity stones in the Infinity Wars comic series. Nebula is jealous of the power Gamora has and will stop at nothing to beat her. The galaxy is in peril, because of family jealousy. 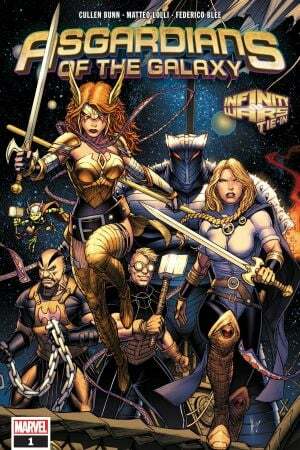 It’s all been done before and repeated many times, but I liked the assembly of heroes in Asgardians of the Galaxy #1. I feel like anything could happen, and while the characters who make up this motley group of rogues are not perfect, there is enough here to warrant further reading as the series progresses. I would rank Asgardians of the Galaxy #1 as 3 Naglfar out of 5. 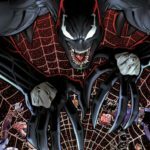 While much of the comic borrowed storylines from past series, and plot twists that have been done many times before, I feel the villain choice is an excellent one, and the group of heroes stray from the normal which can allow writers like Cullen Bunn to get creative and take this series in a new direction.